Decals. Mugs. Decals. I love custom designs! New Mexico heart decal. Zia heart decal. NM decal. Car stickers. Journal decal. Permanent car decal. Peel and stick. Glitter. Metallic. New Mexico decal. Zia decal. NM decal. Car stickers. Permanent car decal. Peel and stick. New Mexico decal. Zia decal. NM decal. 505 old english. Car stickers. Journal decal. Permanent car decal. Peel and stick Glitter Metallic. Announcement 3.17.2018- Hey Ya'll I have a sale going on for a month starting tomorrow! 20% off everything when you purchase $50 or more in my shop. I have tons of tees and vinyl in stock so most orders will ship out same day! Use code BABYSALE in honor of the little Semi bundle on its way soon!! 3.3.2018- So excited to offer you all new vinyl options!! I have added Metallic, Glitter and Reflective vinyl to my listings! These all have permanent adhesive just like the regular vinyl so they will work fantastically on your vehicles or outdoors! Be creative and order a custom design- As always, I am always available to chat!! So excited to share the things I love with Y'all! Please be patient as I continue to add things to my shop. Please feel free to message me anytime with questions- I love to chat and be helpful. 3.17.2018- Hey Ya'll I have a sale going on for a month starting tomorrow! 20% off everything when you purchase $50 or more in my shop. I have tons of tees and vinyl in stock so most orders will ship out same day! Use code BABYSALE in honor of the little Semi bundle on its way soon!! 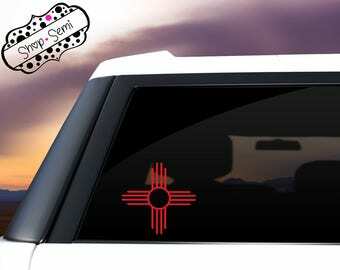 New Mexico decal. Zia decal. NM decal. Car stickers. Permanent car decal. Peel and stick. Tie dye decal. Hippie decal. Llama decal. Puppy decal. Succulent decal. Sea Turtle decal. Car stickers. Permanent car decal. Peel and stick. Tie dye decal. Hippie decal. Unicorn girls onesie. Baby girl gift. Its a girl gift. Baby shower gift. Girlie onesie. Personalized with baby name. Glitter onesie. Military baby onesie. American flag onesie. Military apparel. Baby onesie. Baby shower gift. Its a boy gift. Custom Permanent Vinyl Decal. Custom decal. Advertising decal. Car decal. Laptop decal. Phone Decal. You pick the color! You pick the font! 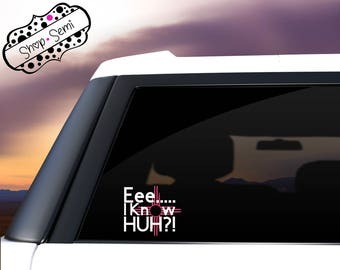 Eee I know huh New Mexico zia decal. Car stickers. Journal decal. Permanent car decal. Peel and stick. Glitter. Metallic. Easy to apply. Received very quickly. I will be ordering more. Loved my cute gift. The zia looks great on my back window of my car! I love it! Me and the Pups! Kreacher and Kauji! Just a go- getter trying to make a better life for my family! I started my shop because I am way too creative and needed an outlet. I wanted to share the things that I love with the people of this world. It makes me happy, it makes my vibe soar and lets face it, I look fantastic in my PJ's. I am a new mother and newly married and I am constantly learning and teaching new things- why not share what I know and the things that I love? Anyway, I love to chat so feel free to send me a questions or just say hello! Hi everyone! My name is Sarah- Welcome to my shop. I like having my freedom (you know you cant hold down a rowdy Aries) and having extra time to be with my family. I love being creative and will continue adding things that I love to my shop! Where do I get my vinyl? Load this link into your browser and go grab some!